Made in classic Capcom style and meant to blend in with the early Marvel and SFA stages. 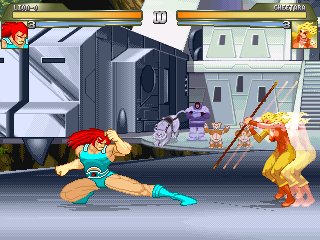 Originally a single piece of pixel art by Kiwi, now modified and programmed into a full Mugen stage by Shin Otaru. Featuring low-framerate cameos, abundant 50% dithering and the glowing eye beacon from the show. BGM by Thor Arne Gald Semb who can be found here and here.